It would be the first hunting season on the bears since 1975, when grizzlies were put on the endangered species list. Yellowstone grizzly bears were delisted in June 2017, with states assuming management duties in August. In response, several environmental groups sued, arguing the U.S. Fish and Wildlife Service (USFWS) has erred in their ruling. Last December, the agency announced it would review its delisting decision after a federal judge sided with the plaintiffs in a case involving Great Lakes region wolves. In that ruling, the judge found the agency hadn’t adequately considered the impacts stripping one sub-population of protections would have on the species as a whole. The new decision is expected March 31. If the agency decides to preserve protections for Yellowstone grizzly bears, then Wyoming’s hunting season will not happen as planned. Montana declined to draft hunting regulations for Yellowstone grizzly bears this year, citing the ongoing litigation against the USFWS. According Wyoming Game and Fish Department’s chief game warden Brian Nesvik, speaking to the Casper Star Tribune, the proposed hunting season is “very conservative” and shouldn’t lead to any declines in the grizzly population. Currently, there are an estimated 700 grizzly bears in the Greater Yellowstone Ecosystem. The proposed hunting regulations also apply to grizzlies living outside places like Lander and Powell, WY; there are no estimates for how many grizzlies live here. Only 12 bears will be allowed to be killed in what is called the demographic monitoring area, a chunk of Wyoming surrounding Yellowstone and Grand Teton national parks that is considered suitable grizzly bear habitat. The monitoring area generally occupies the northwest corner of the state including the bulk of the Wind River Range. It also stretches into Montana and Idaho, though the proposed hunting regulations only apply to Wyoming. Another 12 bears can be killed outside of the area in places that aren’t suitable grizzly bear habitat – such as corn fields on ranches in the plains – or in areas where they consistently cause conflict. 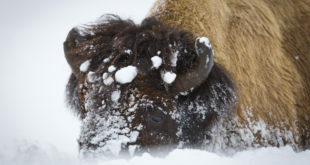 Hunting, of course, is prohibited in Yellowstone and Grand Teton National Parks, as well as in the John D. Rockefeller Jr. Memorial Parkway and the Wind River Reservation. Under the regulations, hunting would be banned within a quarter mile of U.S. highways in the monitoring area and in parts of Wyoming west of Grand Teton. According to the Tribune, this policy is meant to ensure hunters don’t take “roadside bears” like Grand Teton’s Bear 399. In a letter to the Game and Fish Department, the Jackson Hole Chamber of Commerce asked for a similar provision, citing the importance of bears to the regional tourism economy. In the monitoring area, up to two females and ten males can be taken by hunters. This comes with a few caveat, however. According to the Tribune, hunters must report the gender of the bear they kill to the Wyoming Game and Fish Department. If the first two bears killed are female, the hunt will end. This stipulation does not apply to the area outside the monitoring area. Licenses for the monitoring area will be doled out through a lottery, with only two licenses offered at the start. All hunters who receive a license will have to take a course on grizzly identification and will be given a “satellite communication device” to report their kill. Bears will also need to be brought into a Game and Fish office for identification and for the department to take biological samples.